Whilst attending the?screening of Small is Beautiful, Jeremy was able to stay in Hannah’s?this?beautiful tiny house in Seattle on Airbnb,?gave it a whirl and loved the experience. ?Here is an interview with host?Hannah discussing the ins and outs of building her?’Maiden Mansion’. 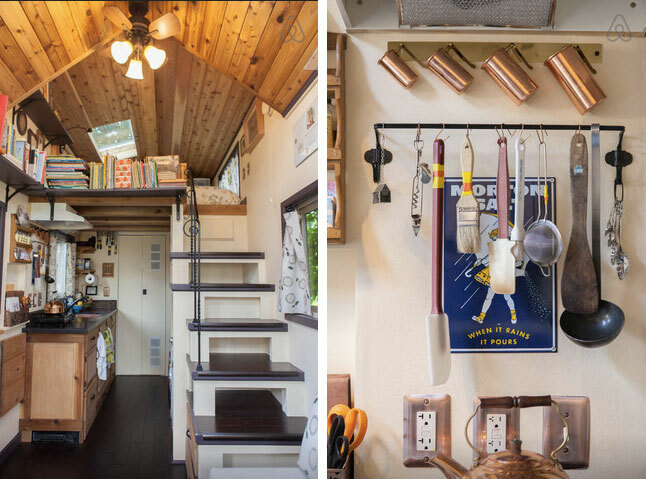 When did you build your tiny house and long have you been living in it? I began my build in May 2014 and had my official open house in February 2015. I lived in it for a few months, but now I rent it out?on Airbnb. I still reserve it for myself on Sundays and Mondays. Where is your tiny house situated? My tiny house is in Seattle, Washington, parked in my mom’s front yard on top of my dad’s pumpkin patch. 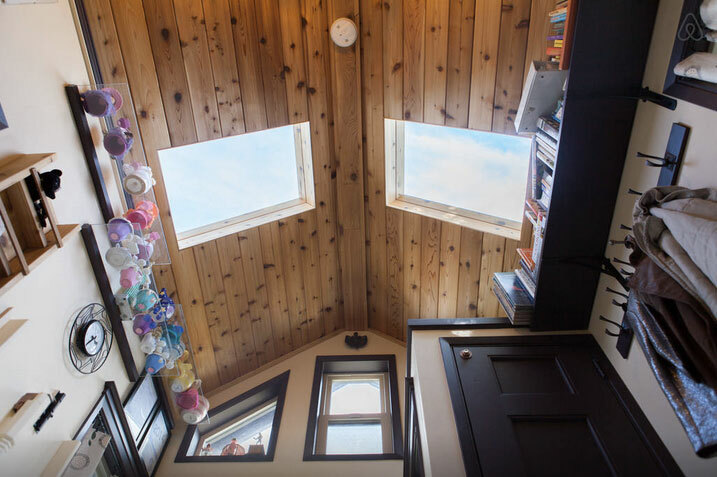 Was it hard to downsize your library and other possessions into a tiny house? It wasn’t too bad, since I actually started downsizing in 2011, so I guess yes it was hard, the whole process is very painful and time consuming, and I am still downsizing. Tell us about your hammered copper sink!? What are some of your favourite design features? I’m a bit obsessed with copper and it turns out it’s a terrible idea to have copper in your tiny house. Finding many things with a copper finish is basically impossible, but I have a steel roof that is copper colored, I have the actual copper sink, copper measuring cups, copper tea kettle, copper light switch covers, copper finishes on my coat hooks and my door hook, little copper hooks to hang my kitchen utensils. I actually used a copper paint on the outside of my house for my door trim and in very small places that are hard to see, like on the sides of my window trim even though the front is purple. My favorite feature would be my trapezoidal windows on the front of the house and also my low led strip lighting around the house, it gives a very comfy ambiance, especially the stair lighting. 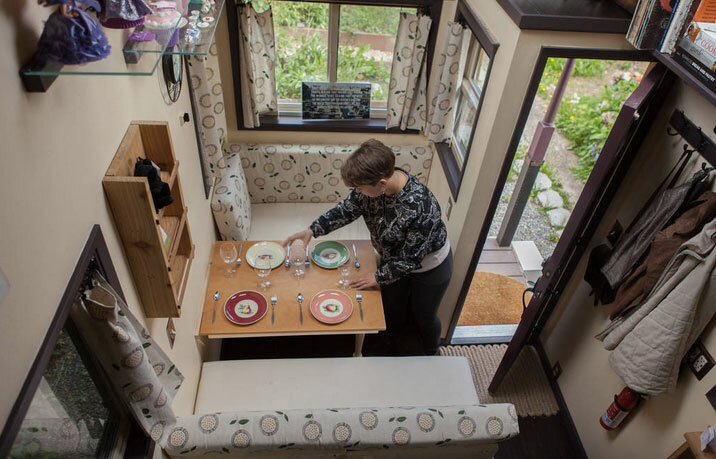 If you were starting out again what would you do differently when designing and building your tiny house? Oh my goodness, so many things. I would definitely hire an electrical company from the get go. I would not do interior trim, I would create a much smoother system where my downstairs couches turn into a dining area and then into a guest bed. Despite how difficult it was starting from scratch and designing it myself with little experience (I built a deck this one time) my house turned out pretty much the same from my original design, I did add a laundry chute! What have been some of the responses from your Airbnb guests? 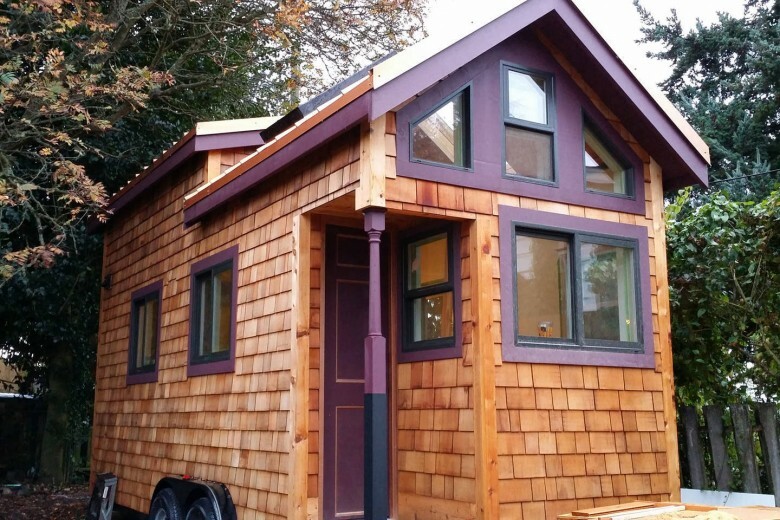 What inspired you to build tiny house in Seattle? My father built the house I was born and raised in, I always planned to build my own home, when I saw an article about a woman building a tiny house I absolutely knew that was perfect for me. I’ve always slept, lived and worked in small spaces. SO much cheaper. In less than a year, I have a home! What a sense of security for me. I plan to design and build many more, but if life fell apart I would tow my tiny house to a farm in Rice, WA and just live out my days working on the farm. No, no, people do not build tiny houses by themselves. It makes a great headline though. ?It’s incredibly dangerous to attempt to do so. ?I had a carpenter for the rough framing and roofing here with me. Then I had a finish carpenter. I had several people come through for electrical and plumbing.? Mind you I did pay all these people and I still was there working alongside them. But here’s the thing: this way I could get it done right and I could it done fast. All in all with materials and labor I spent around $50,000 on my tiny house. How can people stay in your tiny house? They can go to my website which is PocketMansions.com and from there click on the pop up that takes you to my Airbnb site! Would you like to stay in Hannah’s tiny house in Seattle? Book it on Airbnb over here. Why are you interested in Tiny Houses?